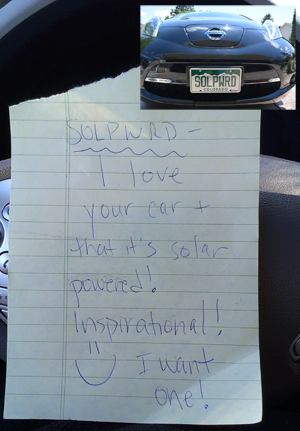 Someone left this note on my Nissan LEAF. Sometimes when you do the right thing — like power an electric car with sunshine, something I’ve been doing for about 10 months — you get recognition for doing so. Yup, this little gesture of kindness, definitely made my day :-). Anyone else out there have stories similar to this one? If so, please share them in the comments field below.